Antarctica is one of those bucket list destinations that many dream about but few ever experience. For one thing, it’s expensive and getting there takes a commitment of time, a spirit of adventure, and a willingness to endure seasickness should the dreaded Drake Passage behave badly during your journey. Is it worth it? For me, yes. Penguins make me happy and spending hours watching them waddle around in their permanent tuxedos was worth the trouble of getting there. The White Continent is home to albatross, whales, seals, and those adorable penguins who live surrounded by icebergs and snow. It’s remote, fascinating, and almost otherworldly. Recently, I had the good fortune to visit this amazing continent at the bottom of the earth. Getting there isn’t easy, but I would do it again in an instant. If you’re considering a trip to Antarctica, here’s some things you should know before you go. If you’re traveling from the US, you will most like depart from South America. We arrived in Buenos Aires a few days before our scheduled departure. From there, we boarded a charter flight to Ushuaia – the southernmost town in the world and the point of departure for most Antarctica expeditions. Departing from Ushuaia, we sailed out through the Beagle Channel where the waters of the South Atlantic and the Pacific Oceans meet. The channel is a natural boundary between the neighboring countries of Argentina and Chile. From the channel, we headed into the dreaded Drake Passage. Separating South America from Antarctica, the waters of the Drake Passage are known to be the roughest in the world. In severe weather, waves can reach a height of over 33 feet. We were fairly lucky with a passing that ranked about a 5 on a scale of 10 as to difficulty. Others aren’t so lucky. The key to managing it is to have an array of sea sickness combatants on hand just in case. 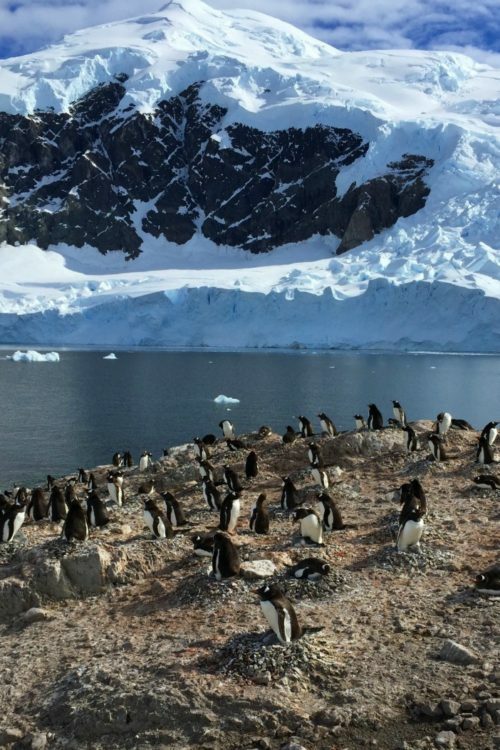 There are numerous companies offering cruises to Antarctica, but if you want to actually set foot on the continent, you will want to choose an expedition over a cruise. A small to mid-sized ice strengthened vessel is your best bet. For our expedition, we chose Quark. Our ship had about 180 passengers on board along with a fabulous expedition team comprised of environmentalists, historians, scientists, and photographers. We even had Penguin Lifelines Scientists from Oxford on board – isn’t that an awesome title? 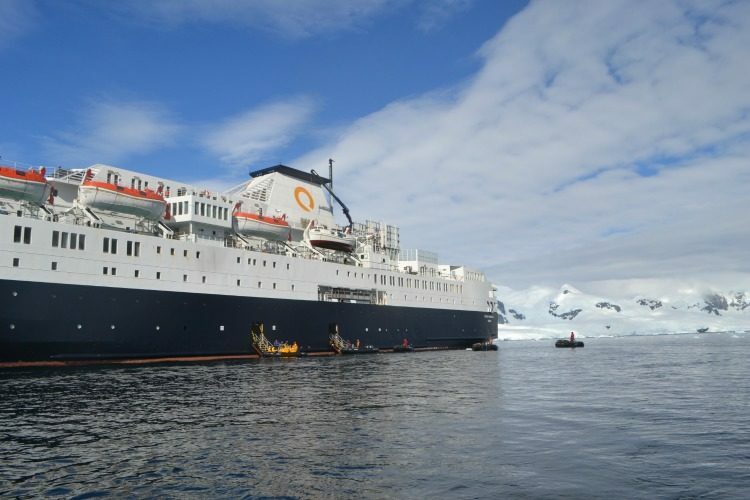 Our home aboard Quark’s M/V Ocean Endeavour offered comfortable accommodations, delicious meals, afternoon tea, wine tastings, numerous lectures, fitness center, a full-service spa, and entertainment. And with a ship of less than 200 passengers, you really get to know your shipmates. No amount of planning can guarantee which experiences will be available for your expedition. Everything is subject to change based on weather, ice, whatever the seas want to whip up, and the wildlife you discover along the way. The captain and expedition leaders are constantly observing the surrounding conditions to determine which way to go and which landings will be safe for exploration. Once anchored in a harbor, the landings are scouted out by expedition leaders. If an area is deemed unsafe, you move on to another harbor. But don’t worry, there are plenty to choose from – it’s a big continent! Generally, an expedition will provide opportunities for everyone to land on the continent. Our ship was divided into four groups – Albatross, Leopard, Minke and Gentoo. Each day we’d wait for our group (the Gentoos) to be called to disembark. Then we would head down to the mudroom, don our bright yellow Quark Expedition parkas, life jackets, and Muck boots then board the Zodiac cruisers. Explorations included an hour or so on the continent and an hour of Zodiac cruising. We were greeted with blue skies, sunshine and temperatures around 35 degrees Fahrenheit as we took our first steps on the continent. We hiked around the land and watched the penguins traveling up and down the “penguin highways” from their nests to the water. 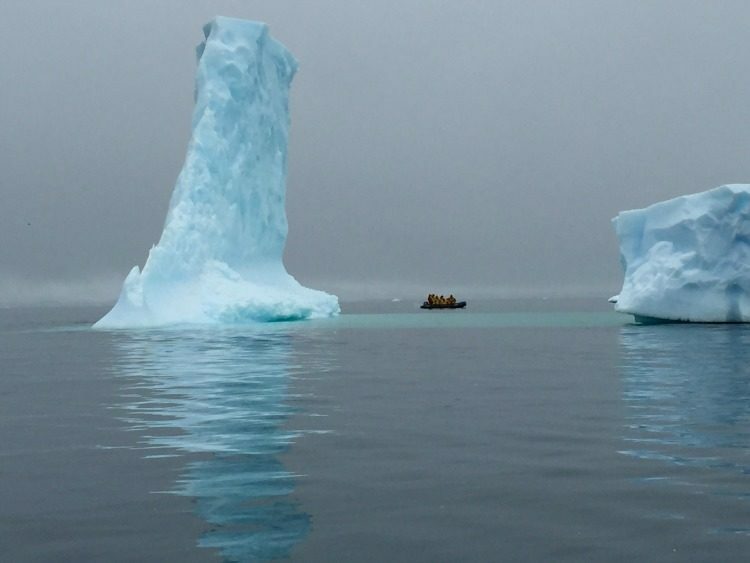 Aboard the zodiacs, we cruised through iceberg galleries, watched seals lounging on the snow and ice, and scouted for whales which occasionally delighted us with an appearance. At times we just sat silently taking in the grandeur of all that surrounded us. Quark Expeditions offers the option to camp on the continent. 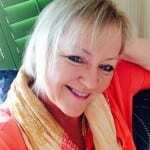 I thought about it – but then I thought about the warm bed in my cabin, the bathroom just steps away, and the wine in the ship’s bar. 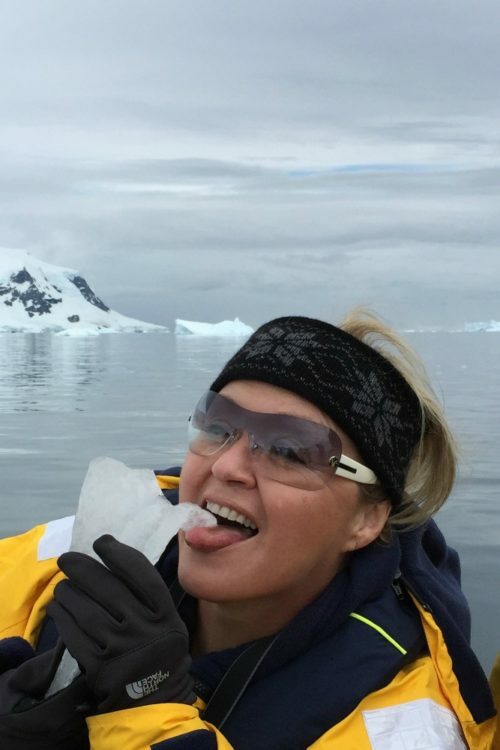 While I’m sure it was a memorable experience, the reality of sleeping on ice all night with no bathroom facilities and no way back to the ship was met with mixed reviews by participants. 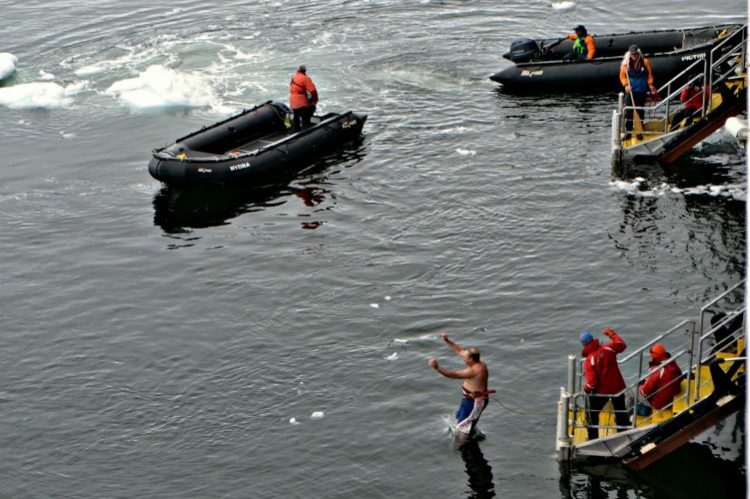 The Polar Plunge is an entire other level of insanity where people jump off the ship from the Zodiac bridge into the icy waters of the Antarctic Ocean. Obviously they aren’t in the water long – but our expedition had over 40 frosty participants. No matter who you talk to that has visited Antarctica – you will get a different story. Landings are determined based on weather, timing of your visit and conditions on land when you arrive. We visited in January after all the fuzzy little baby penguins had arrived. Watching the parent penguins feed their hatchlings is something I will never forget. On day two in Antarctica we were on track to pass through the Lemaire Channel into Pleneau Bay. 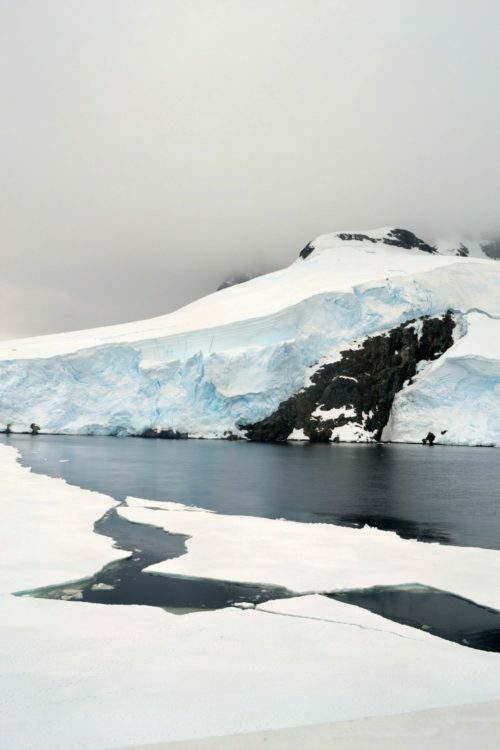 The Lemaire Channel is a narrow passage that separates Booth Island from the Antarctic continent. At its narrowest, the channel is less than 800 meters wide with towering peaks overhead – and it is generally full of icebergs and sea ice. Our ship was going to attempt to break through the ice and, if successful, we would be the first to accomplish this in the season. As the captain nudged the sheet of ice, it began to crack in several directions. Seals who had spent the last months lounging on the ice sheets began to roll into the water to move out of the ship’s path. Penguins waddled away from the cracks and hopped one by one into a single file line forming a true march of the penguins moment. No one else will ever experience that. 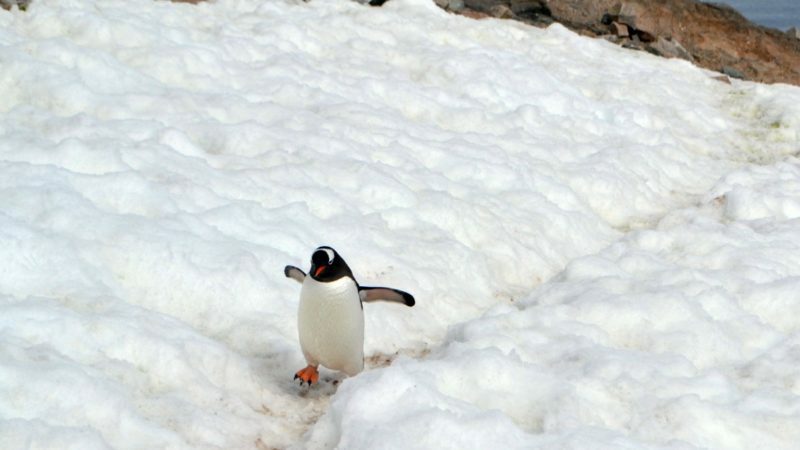 It was a moment – like so many other moments in Antarctica – that cannot be repeated. But don’t worry, if you go to Antarctica, you will experience something equally remarkable. Every moment — and experience — different. I like that notion you share. Grand story. Your expedition ship making frequent decisions reminded of my fave way to do Alaska. small ships are so engaging.